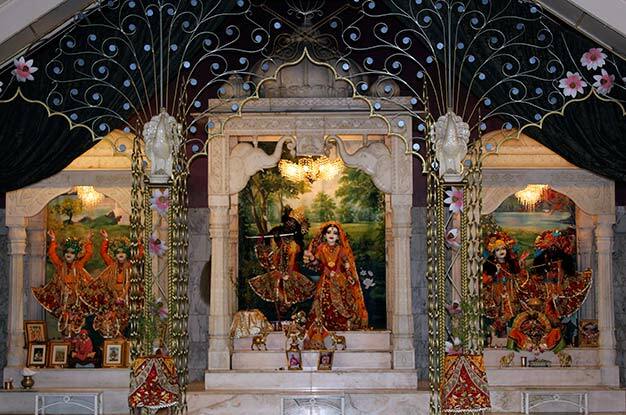 Presiding Deities: Sri-Sri Gaura-Nitai, Sri-Sri Radha Govardhana-dhari, Sri-Sri Krishna-Balarama, and Giriraj. Temple Style: A simple 250 square-meter A-Frame building that sits on an 850-acre farm. Location: The temple is situated in New South Wales’ picturesque Tweed Valley, full of lush green mountains, rolling farmland, and towering rainforests, and often capped by neverending blue skies. The climate is sub-tropical, and the temple lies forty minutes from the beach. The nearest town, Murwillumbah, has a population of only 13,000, mostly farmers, but has an alternative flair with many vegetarians and lots of other religious/spiritual denominations. With no Indian congregation, the temple relies solely on prasadam distribution for its income. Pros: Beautiful, peaceful environment; local people are easygoing and very accepting of alternative cultures; although the temple is close to beaches, the area has a lot of space and is not crowded. Cons: It is difficult to find employment in the area. Known For: Its large-scale prasadam distribution, beautiful scenery, good weather, beautiful Deities and lots of opportunities for devotional service. Number of residents: Seventy people live in the temple, while five hundred live close by and are part of the regular congregation. Number of visitors: 500 per week. Best time of year to visit: Try your luck all year around, but remember, this is Down Under! So heavy rains and the heat of summer will greet you in January, while you’ll find cold and clear skies in June. New Govardhana wasn’t always the thriving community it is now, starting small and surviving many struggles to get to where it is today. 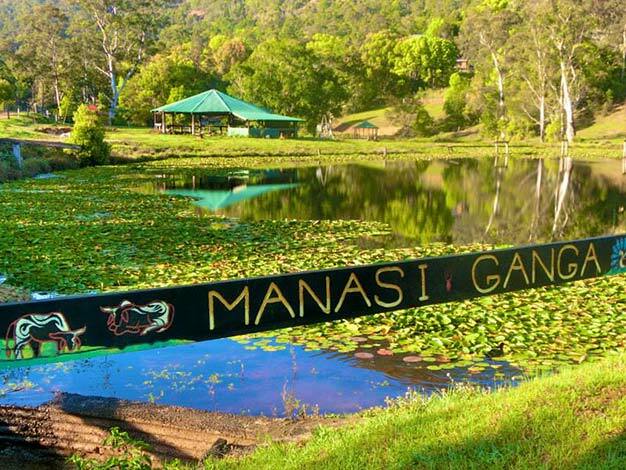 In May 1977, when the 850-acre Murwillumbah property was purchased for $80,000 by its first temple president Sabhapati Dasa, a skeleton crew of only eight devotees lived on it. One house and an old dairy were the only buildings on the property—and with a river running in front of them, they were inaccessible. 1978 the community had grown to twenty-five, and devotees set to work building a simple temple—an A-Frame style building that cost $150,000. As they worked, they lived in caravans, with the Deities of Radha Govardhana-dhari (lifter of Govardhana Hill) residing in the only house which also served as a makeshift temple and brahmachari ashram. By 1979, the temple, an office, a guest house, and a steel bridge across the river had been built. Radha Govardhana-dhari were installed, and the temple officially opened. The community raised more funds by distributing books, then later by making and selling candles and paintings, and in 1980, a gurukula school was built. New Govardhana’s outreach programs attracted many people to join ISKCON, while on the farm, many vegetables and grains were grown, harvested, offered and eaten. But the community ran into financial difficulties when Sabhapati Dasa resigned as the temple president. Savvy with money management, he left the community in zero debt. But fundraising dwindled after his departure, and with a succession of different managers every few years, stability was hard to come by. But there was a secret weapon that would save New Govardhana from the brink of disaster: prasadam. Along with an ambitious team of devotees, Ajita restarted the catering programs at festivals around the country that he had been doing while managing the Brisbane temple, and they quickly became successful. Within four years, New Govardhana had repaid its debt in full, and done much needed repairs to the dilapidated state the community was in after years of financial struggle. In April 2009, New Govardhana devotees opened a Govinda’s restaurant in Burleigh Heads, on Australia’s Gold Coast. With the combined success of the restaurant and catering programs, New Govardhana now grosses about 2.5 million dollars a year. “Between the temple and Deities, the devotees, old infrastructure, repair work, new work, cows, agriculture, roads, and festivals, the community costs $10,000 a week to maintain,” Ajita explains. When Ajita moved from Brisbane to become the temple president in 1997, the community was steeped in debt. 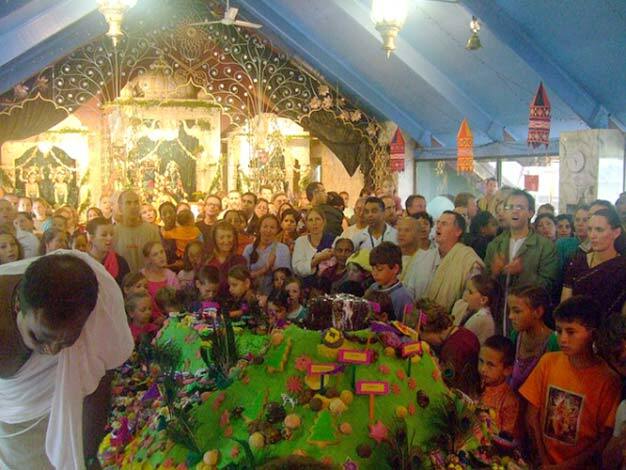 Govardhana is now a busy community of 500 devotees, with a number of successful projects. The WWOOFing program (Willing Workers on Organic Farms) attracts dozens of young people every week, who, in return for accommodation and prasadam, grow vegetables, and help around the property. Some attend the temple morning program, and some even become devotees. Meanwhile, a number of educational, artistic and cultural programs are also based at New Govardhana. 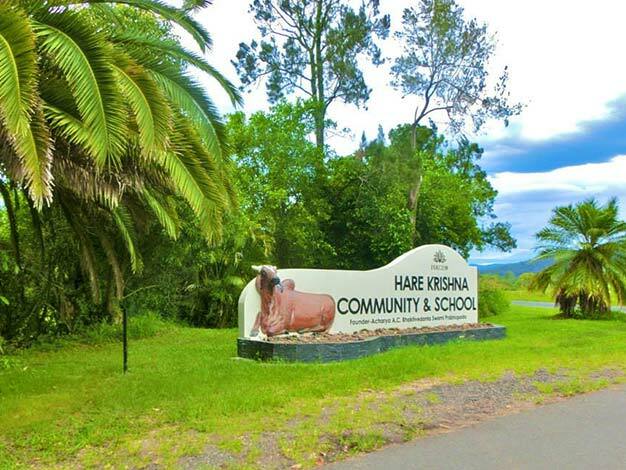 Its Bhaktivedanta Gurukula teaches fifty students from Kindergarten to Year Seven, and its Govardhana College coordinates many seminars on Vaishnava philosophy and culture throughout the year. 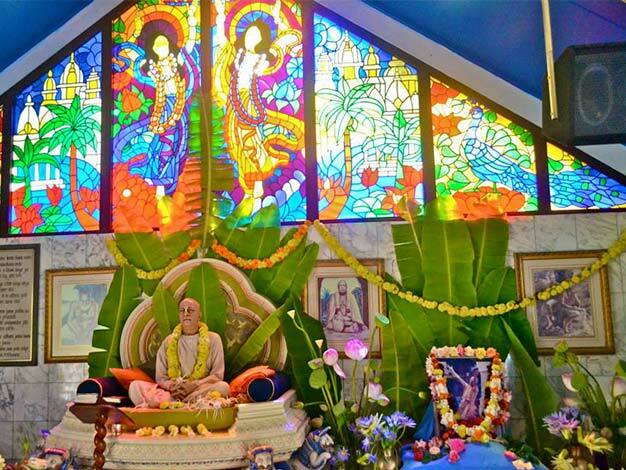 Over the years, the College has delivered courses, seminars and workshops on Deity worship, alternative farming, astrology, Ayurveda, Sanskrit, and numerous Vaishnava study courses including Bhakti-Shastri. Through the College, New Govardhana has also presented a number of Cultural Evenings to the wider community. “Spirit of India” showcased a range of Vaishnava arts presented as a beautiful cultural event, while devotional spectacular “Spirit of the Gait” attracted some of the world’s best Indian classical dancers. 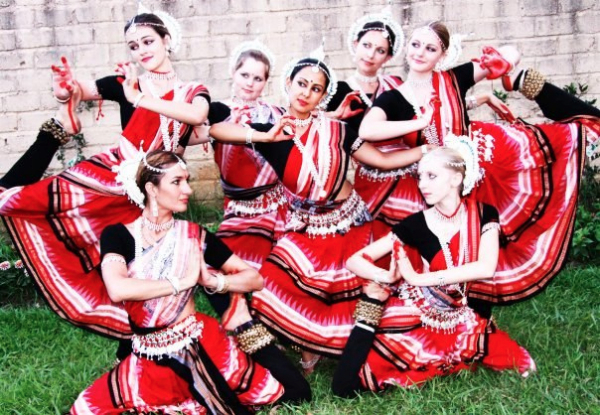 New Govardhana is also home to Mohini Murti Dasi’s Natya Shakti Dance School, which teaches traditional Odissi dance to over thirty students of all ages. “There is a definite renaissance in devotional art that adds a world of color, movement, entertainment, education and upliftment to the community,” says Govardhana College Director Damodara Pandit Dasa. Next, New Govardhana is set to build a brand new temple—phase one of construction, which consists of a new commercial kitchen, prasadam hall, and conference hall is already underway. A new brahmachari ashram is also being built, making the previous one available as accommodation for retreats the community plans to start offering soon.